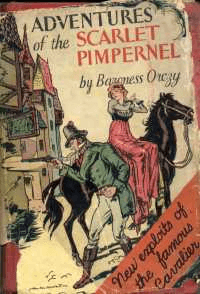 Is the Scarlet Pimpernel the First Modern Superhero? I started watching the Scarlet Pimpernel TV series in the late 1950s before I ever read the book. It was a very exciting, nail biting experience and when, during the day the call went out It’s the Scarlet Pimpernel, we children all gathered in someone’s house to watch the action. We rousingly cheered on the good guys and booed the baddies. Before our eyes the first modern superhero, the Scarlet Pimpernel, carried out escapades with great daring-do. Snatching up the oppressed and sneaking them out of France right under the officials’ noses. At that age we hadn’t heard about the French Revolution. That was for later years at school. We play acted out the stories and while researching this superhero I finally realised where my common exclamation of ‘zooks’ (gadzooks) came from! I still use this frequently 50 years later. The story was set during the French Revolution that occurred in the eighteenth century. 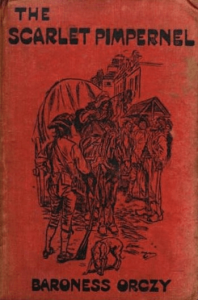 The play and subsequent novel was written in the early twentieth century. Ms Orczy must have done some heroic research herself as, from all accounts, The Scarlet Pimpernel closely mirrors history. Many characters are based on actual people. The baroness was a Hungarian painter and writer. Her writing, mainly based on this “most famous” character and his distant predecessors and friends, lives on and is still recreated in modern musicals and on modern media such as film and TV. The books are still in publication. Not bad for a writer of yesteryear! The prose, originally written as a play, is written in surprisingly modern language. When adapted for the stage play in 1905 it was a massive hit in Britain. The superhero is represented in the “foppish foolish” manner PG Wodehouse portrays his Bertie Wooster. The image is one portrayal that seems to resist changing to the real character of the British. Or is it in fact still relevant? It’s been a long time since I read the book (I am certainly ready for a full re-read) but the defining goal was to save the crown prince (Dauphine) of France. Although he shouldn’t be revealed yet, Sir Percy Blakeney masquerades as a typical popinjay of society. In fact he is the (just) invincible superhero “with a secret identity”. In his adventures he accomplishes this with the various ruses. You might like to read the book to find his resume of ruses. Some were pretty devious! In real life the Dauphine died in prison. Unlike his parents he escaped Madame la Guillotine. 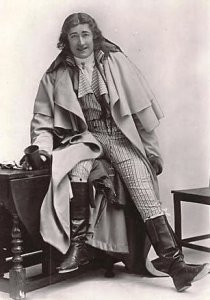 In the process of rescuing Louis, many other feats and accompanying disguises were accomplished in the saving of persecuted and “unjustly convicted” gentry and their commoner helpers. My interpretation of the gentry is that they were so embedded in the strata of the noble their excessiveness that down trod the masses was normal to them. There were actually quite a few arch villains in the tales of the Scarlet Pimpernel. The stickiest, most persistent arch villain was the always blackly clad Chauvelin, a crafty character, who was the French ambassador to England. The ‘Bastille’ initiated the French Revolution and the committees enforced the rules of the dictators. These rules only favoured those who ruled and tramped over everyone else. Modern media has softened Chauvelin’s character somewhat. The fact is that he was an outright villain and cared only for himself no matter the impact on others. Modernising to political correctness is so annoying sometimes. I think the best ruse the Pimpernel used with Chauvelin was his use of ‘pepper spray’ via means of disguised snuff. Up the old snoz and a huge blinding sneezing fit. And in the confusion he foils the guards again. As with most superheroes there was a strong support cast. The league itself was comprised of twenty nobles who regularly stepped outside their comfort zone during the act of rescue. It was supported by the brave hearted, altruistic commoners who helped them along the rescue route. The start of the climatic ending was the finding of a letter during a surprise attack on members of the league. As the letter was from Sir Percy’s wife’s brother, Chauvelin (the really bad guy) set out to blackmail her, the scarlet woman, into revealing the Scarlet Pimpernel. At that time she had no idea who he was. I think most stories written when this was had an actress or singer or such influencing the story line and adventurer, in this case the lovely Marguerite St. Just. She represents a good twist to the heroine character with strong ties to the baddies, albeit not with the intention of harming the hero. Marguerite is denounced by one of the saved gentry thus beginning the cool attitude exhibited towards her by Sir Percy. Accidentally she discovers his identity and sets out to save her husband leaving her poor brother to fend for himself. After much misadventure, the disguised Pimpernel is severely beaten. The rescuing the rescuer Marguerite is totally exhausted and worn to unconsciousness (swooning I believe). Although proving to be a tenacious heroine, the portrayal of the helpless female shows in the final scenes. But love overcomes all in the style of the true historical romance. And during the process of rescue and making up, and finishing the adventure the villain is banned from England. 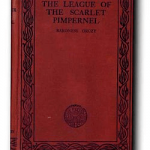 Is there any Scarlet Pimpernel questions, insights or anecdotes out there? If you have any I would really like you to let me know. I will read them and exchange more comments with you in response or answer. Love to Read in the Bath Tub! I wrote my first adaptation of The Scarlet Pimpernel when I was 12. My English teacher said she’d enjoyed it but it perhaps wasn’t the best choice for an all-girls’ school. Now I have a new stage adaptation. It has already had a rehearsed reading in Glasgow with a professional cast. Our Kickstarter launches on Monday 4 June. Our video is on YouTube under The Scarlet Pimpernel – the original superhero. Wow, I just watched the trailer. I am really glad I didn’t go to an all girls school. What was wonderful was, being in British Columbian schools, I remember no sexism at all and our teachers read us a great assortment of books with loads of different outlooks. Thanks for your comment. I see you certainly agree with my choice of the first modern superhero. i use modern as there are older ones, but none that appeal to me so much! If you want, and are able to, look me up on Wealthy Affiliate. Hi, just an update on my play. If you search for Bonnybridge Playwright Falkirk Herald Scarlet Pimpernel the article should come up. Helen, it looks like this is going to be a really fun and colourful play. Your concentration on his wit sounds ideal. I loved the books and the TV show. I will have to wait until your film comes out to see it though!! I saw the word Falkirk in there and must say I am most impressed with the Falkirk Wheel. It is a true engineering feat. And so elegant too. Maybe one day I will get over there to see it. “Them were real heroes back then – not all this super human, special effects, action stuff of today”. ha ha Great Site and excellent summaries of the books here I will book mark to return and view again. Hi Peter, nice to hear from you. Back then we sure had the ability to use our imaginations. We weren’t spoon fed the how, who, where and why. And everyone got something different out of the stories. That is why I still prefer reading. Please do come back and visit again sometime. Is there anything you like that I can do my version of a review on? We have never read the book on the Scarlet Pimpernel. Like you, we did see it on TV though. As you said, it was exciting and nail biting and I’ll even add, cloak and dagger exciting. We love the way you describe the story background and the characters. Thanks you two for commenting on my post. Like you I found it very exciting. And who says kids nowadays have so much more. Not where it counts I think. It’s true too when you talk about re-reading the book. I am doing that right now and there might be an update on this post soon!